Italian press commentary, 2017. Len Klimkeit/Press Association. All rights reserved. Social media and journalism go hand in hand. There are very few reporters and columnists who are not on Twitter; and although it's true that some actually tweet only every now and then, to be in the news industry and ignore Silicon Valley's media monsters is just impossible. So, are social media influencing journalists and to what extent? Let's try and answer this million-dollar question by looking at a recent print issue of MicroMega (3/2018), in which some of the most prominent voices in Italian journalism were interviewed about the current state and future prospects of the news world. The bi-monthly review, one of Italy's most serious publications, shed interesting light on the national press. Many world facts were debated in a panel-like setting and moderated by a doyen of the international press, Paolo Flores d'Arcais. A conversation between two of Italy's most important newspaper directors then discussed the wider impact of fake news. How they viewed Britain's decision to quit the European Union made for a truly extraordinary read. Arbitrarily manipulated news, in their only shared opinion, were propagated by anti-Brexit, liberal newspapers. Without mentioning any specific names – neither titles like The Guardian or The Independent, as you would've expected, nor any journalists – Molinari and Travaglio were adamant that Brexiteers had voted to leave as a rejection of the supposed pressure they felt from the established press. This conflation with the circumstances of US presidential elections was quite extraordinary. Their argument ignored the fact that Euroscepticism has a long history in Britain, to which both conspicuous strands of right and left have always contributed since at least the end of WWII. Let's be clear: Molinari and Travaglio are outstanding journalists. Molinari, for instance, worked for many years abroad and on his return to Italy brought with him new ways of interpreting the profession. He also criticized how Italian journalism always talks about Islamic terrorism instead of using a more appropriate definition – jihadist terrorism – that doesn't cast aspersions on millions of innocent citizens. Muslims are those who suffered the most at the hand of jihadists. Travaglio, in turn, is perhaps the wittiest hack in Italy – a sagacious wordsmith who always finds a way of highlighting what others have missed out. Without him, debates on Italian current affairs would be all the poorer. Yet, their conclusions on Brexit reveal that even they only know half the story. They seemingly ignored the fact that those behemoths of the British press – the Daily Mail, The Sun, the Daily Express, The Daily Telegraph, The Times – actively voiced their support for Brexit. 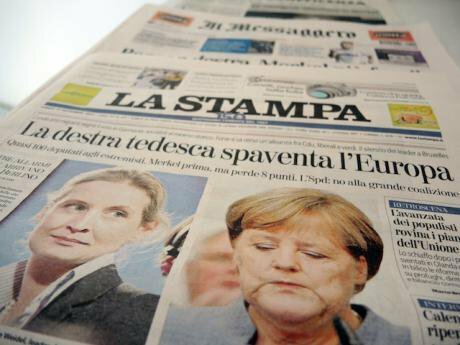 The mainstream daily titles were in favour of remaining in the EU: the ones Molinari and Travaglio had in mind probably have a tenth of the readership of the former group. How could they not know these very basic facts? Back to social media, then. It's quite possible that an Italian bubble now exists which is fuelling, fanning and consolidating stories that are not factually being checked from the outside. This in turn brings back the age-old issue of Italian journalists' poor foreign language skills; dreadful pronunciation on radio and TV are a regular reminder of this. How else can you explain the fact that respected Italian reporters believe it was basically The Guardian who provoked Brexit? Does it boil down to translation only? Is it to do with the fact that ideas once translated into another language can have distorted meanings and thereafter are disseminated as such? Or rather, do feeds act as the basis for the creation and perpetuation of stories in a new language where the original sources have not always been verified? As in the case of Brexit? And what happens when big names reinforce – and validate thanks to their status – suppositions and theories no one from the outside can contradict? 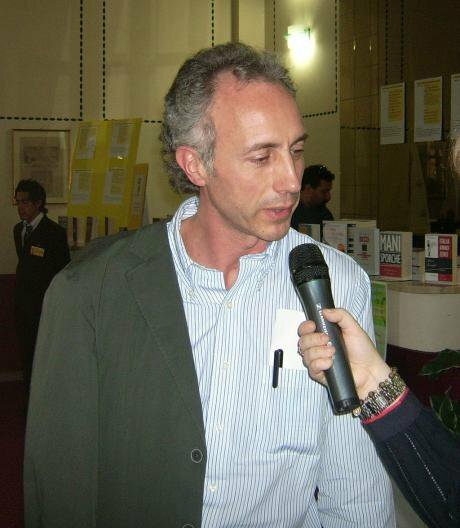 Marco Travaglio, 2010. Wikicommons/ Figiu. Some rights reserved.